We’re holding our next live, in-person event, April 10 at The Assemblage, a beautiful coworking space in Manhattan. My guest will be former President of the Rainforest Alliance and director of NYU-Stern’s Center for Sustainable Business, Tensie Whelan (see her full bio below). Tensie has worked with, influenced, and led some of the world’s largest corporations and their leaders. You will hear inside stories of what has happened and what works in environmental action at the highest levels. Plus she’s friendly, personable, and able to answer questions you’ve always wanted to hear answers to. 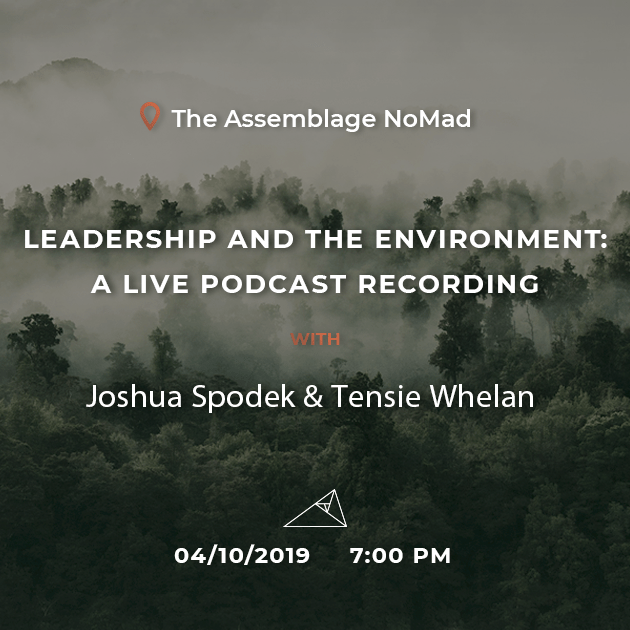 In a live taping of his award-winning podcast Leadership and the Environment, bestselling author, leadership speaker, coach, and professor Joshua Spodek, PhD MBA, brings joy and inspiration to acting on the environment. Joshua welcomes Tensie Whelan, former President of the Rainforest Alliance and director of NYU-Stern’s Center for Sustainable Business, to share her expertise and environmental values. We’ll learn how to lead without relying on authority. As President of the Rainforest Alliance, she built the organization from a $4.5 million to $50 million budget, transforming the engagement of business with sustainability, recruiting 5,000 companies in more than 60 countries to work with Rainforest Alliance. She transformed the Rainforest Alliance frog into an internationally recognized and credible brand. Her previous work included serving as Executive Director of the New York League of Conservation Voters, Vice President of the National Audubon Society, Managing Editor of Ambio, a journal of the Swedish Academy of Sciences, and a journalist in Latin America. Tensie has been recognized by Ethisphere as one of the 100 Most Influential People in Business Ethics, was the Citi Fellow in Leadership and Ethics at NYU Stern in 2015 and has served on numerous nonprofit boards and corporate advisory boards such as the Unilever Sustainable Sourcing Advisory Board and the Nespresso Innovation Fund Advisory Board. She was most recently appointed as a member of the Board of Directors for Aston Martin and GlobeScan, to the newly created Global Advisory Council for Odebrecht and as an Advisor to the Future Economy Project for Harvard Business Review.